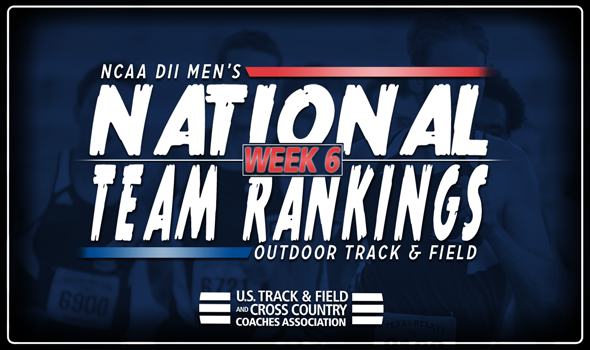 NEW ORLEANS – The top-three teams in the NCAA Division II Men’s Outdoor Track & Field National Team Rankings remained in place from a week ago in the newest round of rankings, announced the U.S. Track & Field and Cross Country Coaches Association (USTFCCCA) on Tuesday. Pittsburg State, Texas A&M-Kingsville and Texas A&M-Commerce all held their ground in the rankings, coming in at first, second and third, respectively. The Gorillas and Javelina have managed to remain in first and second, respectively, for the last four-straight weeks. Outside of the top-three, minor changes peppered the top-10 of the rankings. Adams State moved into the top-five for the first time on the season, as it jumped four spots to fourth. The Grizzlies were outstanding at the Bryan Clay Invitational this past weekend, where star junior Sydney Gidabuday ran the second-fastest 5000 time in NCAA Division II collegiate outdoor history with a finish of 29:02.97. Teammate George Kelly added a time of 13:52.03 in the event, good for third on the NCAA Division II Descending Order List. Kale Adams added the second-best steeplechase time in NCAA Division II this year to the Grizzlies’ weekend résumé at the Mt. SAC Relays with a time of 8:45.23. Tiffin also jumped in the rankings, moving up one spot to fifth. The Dragons saw NCAA Division II Automatic Qualifying marks set by James Ngandu in the 5000 (13:47.92) and Jalon Monigan in the triple jump (15.98m/52-5¼) at the Mt. SAC Relays and Bryan Clay Invitational, respectively. However, the top-three teams did just enough over the weekend to remain the teams to beat heading into the conference championship weekend. Texas A&M-Kingsville’s Richard Cervantes recorded the top shot put mark in NCAA Division II this year at the LSU Alumni Gold, throwing 19.27m (63-2¾). Charles Greaves added the second-best triple jump mark on the NCAA Division II Descending Order List at 15.79m (51-9¾). Both marks were NCAA Division II Automatic Qualifiers. Texas A&M-Commerce notched four top-10 NCAA Division II Descending Order List marks at the Mt. SAC Relays, with the 4×400 relay team leading the way with an NCAA Division II-leading 3:07.47. Pittsburg State stayed in first after a relatively quiet week at the Kansas Relays. Outside of the top-five, CSU-Pueblo (eighth), Grand Valley State (ninth) and Ashland (10th) all moved up in the rankings. CSU-Pueblo saw Devundrick Walker and Derrick Williams hit NCAA Division II Automatic Qualifying Marks in the 800 and 5000, respectively, while the Lakers of GVSU had a solid showing in the 5000 of the Bryan Clay Invitational, where Zach Panning and Enael Woldemichael posted the fourth and fifth-fastest 5000 times in NCAA Division II this season, respectively. Ashland returned to 10th-place, where it was ranked during the second week of the season. After slipping all the way to 21st, the Eagles have battled back into the top-10. Elijah Talk (shot put) and Nick Zak (hammer throw) each recorded NCAA Division II Provisional Qualifying Marks at the OSU Jesse Owens Track Classic over the weekend. Chico State remained in seventh place on the week, while Angelo State dropped two spots to sixth.